A day to remember with Neville Mackay heading up this fun and fabulous workshop! Come learn and laugh! A day to remember with Neville heading up this fun and fabulous workshop - learn and laugh! 'A Walk Through the Exotic Woodland' am program 9-12 relaxed garden inspired design with mosses, twigs and other natural additions and both locally sourced and exotic flowers - like Tropical Nouveau meets Woodland design! Then in the afternoon a focus on the new and huge trend in Oasis Midnight Foam. 'Back In Black' will teach designers how to use this hot new product using this new foam as both a decorative accessory and a medium that can vanish into the background. It’s not all flowers (or spare time!) though, as Neville has received several awards for his philanthropy work, including a commendation from the Lt. Governor of Nova Scotia. Neville also hosts tours to the UK and is working with a company to host others to South America, etc. His first book, “Neville on the Level!” is out and he’s got two more in the go! He's designed floral arrangements for celebrities and Heads of State, including Rod Stewart, Glen Close, Paul McCartney and members of the British Royal Family. 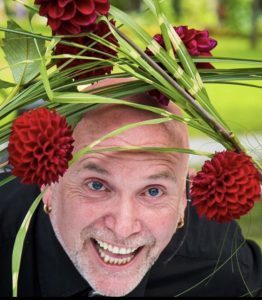 Neville writes for several publications Internationally, including Canadian Florist Magazine and his floral works have been featured in many national and international magazine. 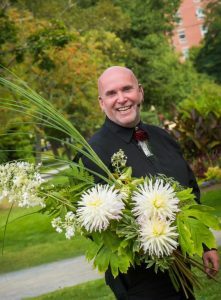 Neville is an accredited Floral Judge through the World Flower Council, was inducted into the Canadian Academy of Floral Art in 2011, and is a member of Professional Floral Communicators International, . Check out all things “Neville” on his face book page, Twitter, (Or google him…it’s fun!) or on his website, www.mymothersbloomers.com.